Do you want have long hair, but don't have much time or patience to wait for them to grow? Then look into trying to wear hair extensions! 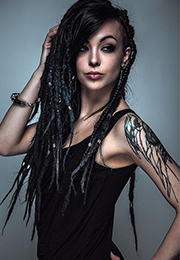 Hair extensions are natural looking, but they can take a while to apply. 1. 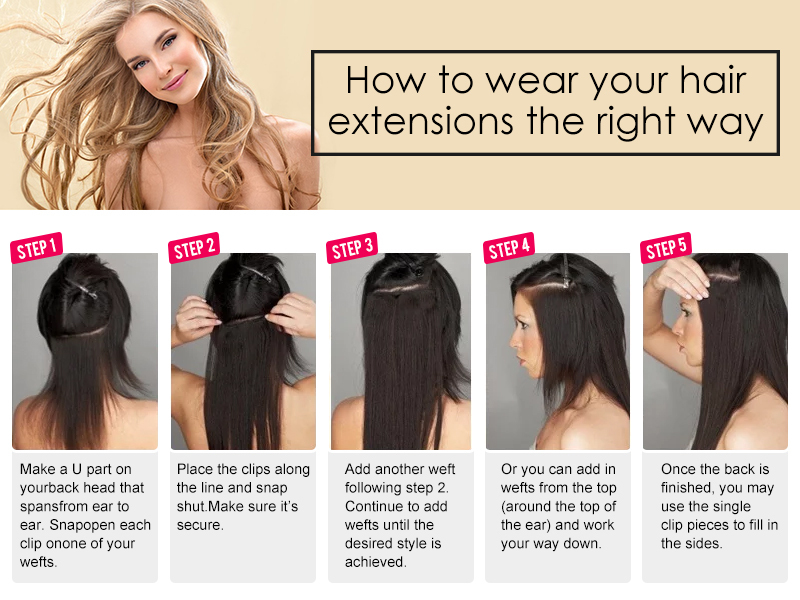 Decide what kind of extensions you want. There are two kinds of materials about hair extensions: human hair and synthetic hair. Both can be worn for months and washed, brushed, straightened and curled while they're in place. However, they are have some distinct differences between them. 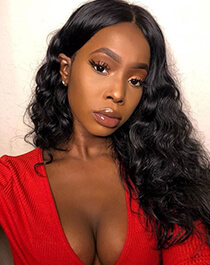 Human hair: human hair is the popular type for extensions, it’s easy to take care (treat it like your own hair) and the hair looks like your own hair, it have lots of advantage, it can be dyed, drifted, curled, straighten and so on. If we take care of it as our own hair, It can be use a long time. Synthetic hair: it’s a man-made keratrin/plastic mix that mimics the appearance of human hair, it also have some advantages, such as the price is cheap, the style is very much, the appearance is like human hair, but it have some disadvantage, it don’t like the real hair can be hot, dyed, curled, straighten, take care it is no easy, and it’s also easy tangle and shedding when wear them. 2. Think about clip-in hair extensions. These are either synthetic or human hair that are attached to a hair clip at the base which allow for temporary extensions to your hair. These are a great option if you only want extensions for a particular event or day. 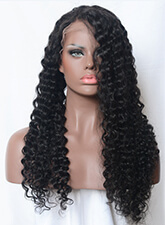 These are the cheapest available hair extensions, and to install are also the easiest. They only take only minutes to put in. Clip-in extensions must be reapplied on a daily basis as they begin to fall out over the course of a day. They are not very comfortable to sleep in. 3. Consider fusion hair extensions. 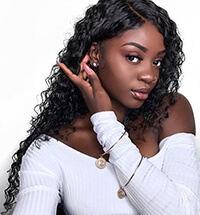 Fusion extensions are synthetic or human hair that is treated at one end with either a special glue or keratin wax that is melted into your natural hair.Fusion extensions are the longest lasting extensions, but are also significantly more expensive than clip-ins. Although fusion extensions use heat, they are not too damaging to your natural hair. If you are afraid of damage, look into cold fusion extensions. Due to the difficulty in applying fusion extensions yourself, for the best way have a friend or stylist apply them for you. A weft of hair is a single row of hair to be clipped between your own layers of hair to add length. 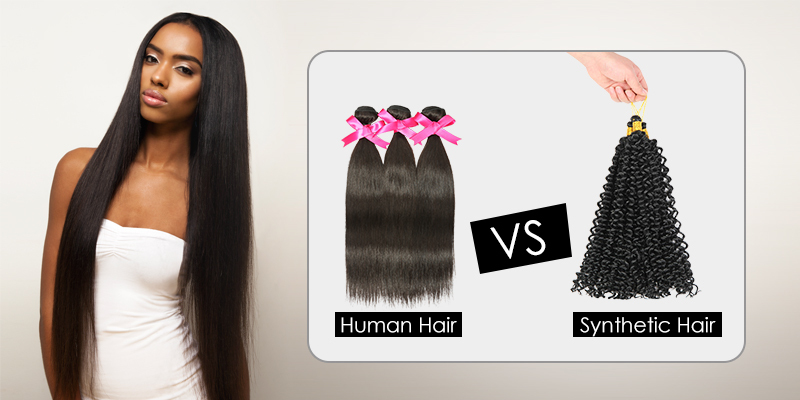 You can buy either synthetic or human hair in wefts, with the latter being the pricier of the two options. Find the right length of hair. Although you obviously want your extensions to be longer than your current length, avoid adding a dramatic amount of difference between your natural length and the extensions. Not only will it obviously look fake, but it will cost a significantly higher amount of money. Stick to 4 inches of extra length at the most. 2.Divide your hair into sections. You can do this by pulling all of the hair on the top of your head into a ponytail. Leave a thin section of hair down against your neck/back. As you add extensions, you will continue to let down more sections of hair of about an inch each. Take a back-comb and rat your hair at the roots. 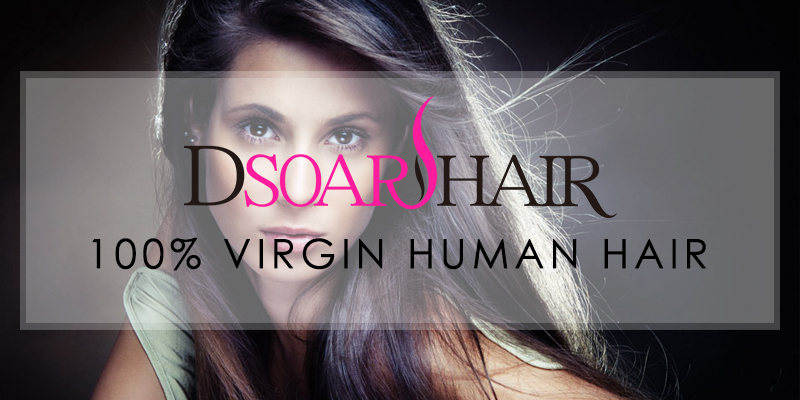 You want your hair to gain ½ to a full inch in volume at the base of the strands. 4.Take one weft and clip to your hair at the roots. You should be able to dig into the teased section of hair to allow for the best stick. 5.Remove another section of hair from your ponytail. Repeat the same steps as above, by teasing your hair at the roots and adding in one weft at a time. Tease your hair at the roots and brush out the top layer so that it is smooth. Your clip-in extensions should be completely blended so that you cannot see them at the roots of your locks.